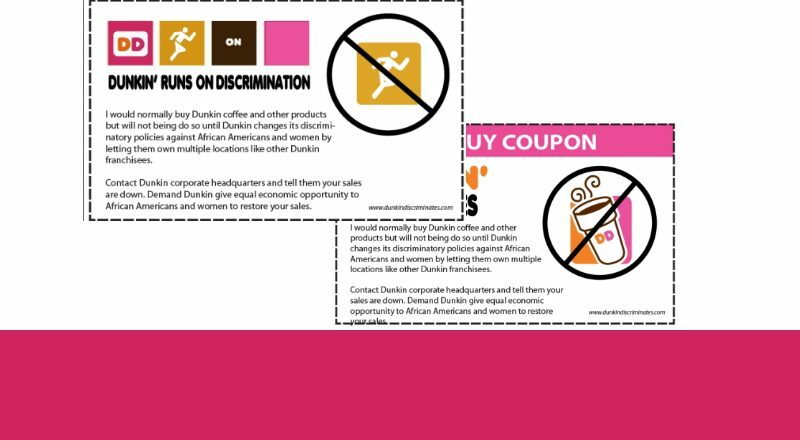 Dunkin’ Donuts last female African American franchise owner is suing the coffee and donut franchisor, alleging discriminatory franchise practices against women of color. 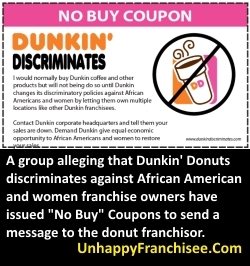 (UnhappyFranchisee.Com) According to a newly filed lawsuit, of the more than 7161 Dunkin’ franchises, only one is owned by an African American woman. And the single female African American owner, Nance Pretto Simmons, claims that Dunkin Donuts is intentionally stifling her growth and not honoring her 3-store development agreement by automatically disapproving any site she submits for her second store. The Complaint NANCE PRETTO SIMMONS vs. DUNKIN’ DONUTS FRANCHISED RESTAURANTS, LLC, and BASKIN-ROBBINS FRANCHISED SHOPS, LLC was filed 9/25/17 in The United States District Court for the District of Maryland (Southern Division). Ms. Pretto Simmons is represented by Corlie McCormick Jr. of the McCormick Law Firm, Annapolis, Maryland and Gerald A. Marks of Red Bank, NJ-based Marks & Klein, LLC. The lawsuit alleges that the Dunkin’ Donuts chain had up to five African American women as franchise owners, but all but Ms. Pretto Simmons have left the system. According to the complaint, Pretto Simmons entered into a three-store development agreement with Dunkin’ in 2004, and opened her only store in 2006. Despite the fact that Pretto Simmon’s store has been well-received by the community and deemed to have “met or exceeded brand standards,” Dunkin’ Donuts has allegedly blocked her further growth. failed to provide her with any assistance to locate suitable sites. Nance expended significant time and resources to find a second location from 2006 to 2015 but she was falsely told that the thirty-two (32) sites she located and submitted to Dunkin’ were “unsuitable” for various unfounded/bogus and discriminatory reasons. which is the reason most male Caucasian and Asian franchisees own more than three locations. The complaint alleges that discrimination is the sole reason that Dunkin’ Donuts refused to grant the site approval necessary for Ms. Pretto Simmons to reach her potential as a multi-unit franchise owner. c. Requiring Defendants to implement a “Remedial Damages” program or programs to foster and assist African American female franchise ownership in economically advantageous areas, which would be monitored for compliance and efficiency by an appropriate Human Rights agency or company designated by the Court, the cost of which will be borne exclusively by Defendants.